In the early 1920’s many of the textile leaders, bankers, doctors, lawyers, educators and other professionals in Gastonia met with the school board and decided to build a new high school in Gastonia. The criteria issued was to build a state-of-the-art facility to serve the needs of Gastonia for a long period of time. 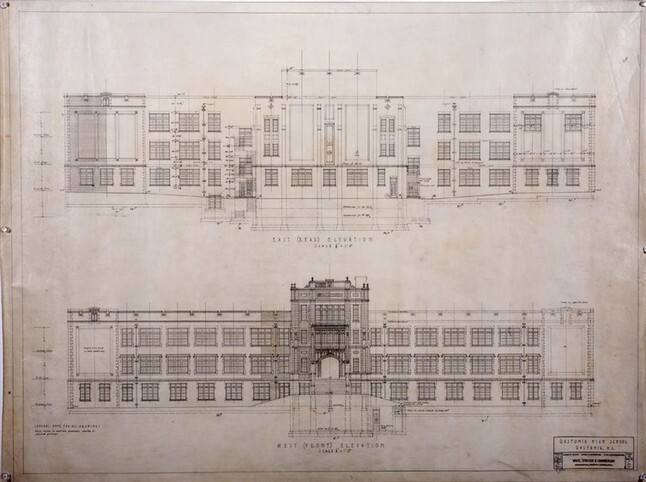 The school was designed by Hugh White, Sr., a local architect in Gastonia that was awarded the commission to design one of the most prestigious high schools in the South. He collaborated with two other architects from Charlotte and formed a 3-man architectural firm in Gastonia. The original school sits on approximately 10 acres of land taking up the size of 3 city blocks and originally contained over 40,000 SF on 4 levels. Some of the features of the original design included an in-ground indoor swimming pool, a gymnasium, and a bank with steel caged teller windows, a wood working shop, a music room and a library. In addition, the school featured a 900 seat auditorium complete with a working orchestra pit and a grand pipe organ costing an estimated $50,000.00. Original construction cost of the school was $500,000.00 in 1923. The ventilation system was state-of-the-art at that time with large fans mounted on the roof that drew return air in cavities within the wall between the classrooms and the hallway to the outside. A coal fired heating system was also present with a boiler room under the front lobby. Around 1931, it became evident that the school had become overgrown. An addition was made along the 7th Avenue face adding 3 floors and some 9 classrooms. You may remember that wing that contained Mr. Thaler's Biology Lab. Around 1938, interior renovations were made to move the Cafeteria from the first floor to the basement. In doing so, the swimming pool was eliminated. You can still see exposed ceramic tile along the back wall that once contained the pool area. The Library was moved from what we know as the "Crow's Nest" to a new floor level that was constructed over what was the Gymnasium. The Music Room was moved outdoors over the Field House. The roof of the Auditorium was actually raised about 8 feet to accommodate a new roof over the Auditorium. The Proscenium or area behind the working stage was raised during that time as well. Again, needing additional classroom space, a major change was made in 1955. A complete new 4-story classroom wing was added on the southeast side of the building. This was connected with an open-air walkway that still remains in place. This addition thus formed a courtyard space beside the Library and new classroom building. That courtyard now serves the residents of the apartment complex. Also at that time, a complete new school building was erected on the north side of the main campus, north of Seventh Avenue, and served as the Gastonia Industrial Education Center. This build remains part of the school property but is not part of Ashley Arms. In later years after Garrison Blvd. was installed, an overhead bridge was erected to connect the two schools. In 1955, the name of the school was changed to Frank L. Ashley Senior High School (or affectionately known in Gastonia as "The High School"). 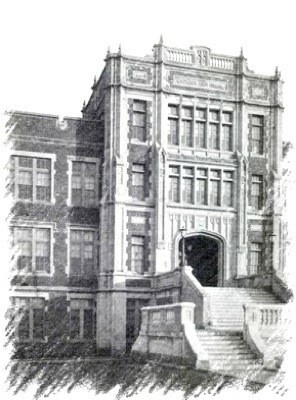 The school remained a high school until June of 1970. After that, it was transformed to Ashley Junior High School until 1986. It was during these years that the building suffered tremendous abuse. A study by a group of Charlotte architects recommended that the school be torn down. The school stood vacant from 1986 until 1988 when the buildings and grounds were purchased by Alan Albright (Class of 1967). It was his group’s intent to convert the school to low income or market rate apartments. The Albright plans were shelved and later that year sold to Mr. and Mrs. C.W. Smith of Gastonia for $500,000.00. This is the exact amount that construction cost in 1923. C.W. Smith retained me to serve as his architect in transforming the school to luxury apartments called Ashley Arms. That exercise took over 4 years negotiating with the City of Gastonia and the Department of Insurance in Raleigh to complete. Mr. Smith was a visionary. He expected nothing but the finest of construction quality. Mr. Smith died in 2010. He and his late daughter Traci remained active in the transformation on a daily basis. The family spent over 6 million dollars converting the school to one of the finest buildings in Gastonia. He spared no expense wanting to make the building into the finest luxury apartment around at that time. As the building was previously placed on the National Historic Register, any construction needed to meet federal guidelines along with complying with the historic requirements and the blessings of the York-Chester Historical Commission. The building now contains 72 luxury apartments, each with a unique design of their own. The building was chemically cleaned bringing back a new look to the limestone and brick and all of the windows were replaced with insulated glass to replicate the original windows. The exterior facade was salvaged. Conditions were met to maintain the historic appearance of the front facade of the building facing York Street. The deodera cedar trees remain out front as a condition to the historic guidelines. Phase One of the renovation took place in the 1955 wing that was not considered historic. The complete facade of that portion of the building was gutted and removed. An addition was made to the east face to accommodate new balconies. An elevator-stair tower was added along Eighth Avenue. This wing once gutted yielded 7 units per floor. The Student Center as many students knew it was converted to apartments as well with on-grade patios. An "open house" was held once the '55 wing was completed. Many curious visitors arrived that weekend to look around. Of all of the comments made, most were concerned about space, wanting to know where to put their formal living room furniture and their grand piano. These were mostly people that went to school at the High School and wanted to sell their house and move right in. C.W. Smith and I looked at each other and agreed that we needed a bigger boat. Preparations were immediately made to renovate the main building. The lockers were stripped out of the hallway. The main hallway then became 6 feet wide where it had been 14 feet. This space became an area for Kitchens and Bathrooms for the new apartments. Primarily, an old classroom was converted to an apartment. The floor plans were arranged so that windows were located in a Living Room or a Bedroom. In that the roof of the main building was completely removed and raised, the upper 3rd floor units have access to a Loft and in most cases access to the roof. If you could go into Fannie Smith's old Chemistry Lab, you would find the tiered floor remains until this day. It is now someone's Living Room and Dining Room. The corner classrooms are basically converted to "studio-type" apartments. Some of the largest units are along the Seventh Avenue (Garrison Blvd.) face of the building. Some of those units approach 2800 SF. The largest unit is the private unit belonging to Mr. and Mrs. Smith taking up two floors in the Crow's Nest area along with additional space that was added on the roof. This one unit is around 5000 SF. (Hopefully it will be available for viewing during the upcoming tour.) As for a tour of the building, you must understand that this is no longer a school, but someone's private residence. The best time to see the entire building is during Christmas when everyone holds an Open House for their units. The Auditorium wing was the final phase of construction. The Balcony was removed and the steel girders that formerly supported the Balcony now support a new level floor that was installed flush with the Main Entrance Hall to the Stage in the Auditorium and a floor above that off the third floor. A new elevator was installed at the Main Lobby now serving 5 floor levels. The Cafeteria as most students knew it is now a Community Area with a Laundry and gathering space. The Library floor has a central Hallway with apartment units off to each side with windows facing either the interior courtyard or the new swimming pool. The Auditorium Floor is now a carved out 3-story area with a central hallway that terminates into an open well just in front of what was the stage. The ornamental facade around the stage remains with new apartments units in the stage area. The ground outside the Cafeteria on the north side was excavated to accommodate a covered heated swimming pool with a removable glass top. The Press Box was removed along with the upper portion of the concrete bleachers thus providing a new parking lot that is flush with the old Cafeteria level. The old gymnasium that was erected around 1970 to serve the junior high school has been transformed into a restaurant (Rodi) and other retail shops and offices on the main level. A new intermediate second level is used for various events and reunions. The Smiths purchased the majority of the old houses that once overlooked the football field and petitioned the City to close the street. The building remains in very good shape. A full fire sprinkler system was added. An interesting note is that the heating/cooling system is a state-of-the-art efficient underground geothermal system with a well out on the former football field and back-up well in the front yard. Water flows constantly to provide perfect year-round cost-efficient heating and cooling with the water being filtered into the swimming pool system and then recycled back into the landscaping and returned into the earth. Of all the discoveries made during construction, the most interesting occurred while removing the chalkboard in the classroom between the original building and the 1931 addition. A beautiful cast stone lions head about 48 inches tall was still mounted to face of the building as was covered up during construction at that time. A similar lions head remains on the face of the southeast facade. The only name I recognized written on any wall was that of "Peach Pearce" (Class of 1963) in the closet under the stair to the Crow's Nest. Today, along with the Gastonia City Hall and Citizens National Bank building, Ashley remains one of architect Hugh White’s masterpieces in the community.